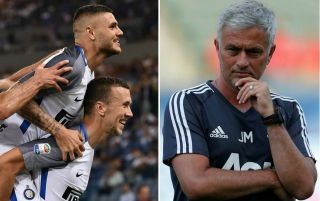 Man Utd and Chelsea have both been linked with a move for one of Europe’s leading strikers, and they could get a decisive boost next weekend. Inter forward Mauro Icardi has established himself as one of the most prolific players in Europe, scoring 106 goals in 180 games for the Nerazzurri since joining them in 2013, taking his career tally to 117. In turn, it’s no surprise that top clubs from around Europe are being linked with an interest, and as noted by The Sun over the weekend, he sparked fresh speculation over his future with Chelsea and Man Utd specifically mentioned as interested parties. Now, it’s been claimed by the paper edition of Tuttosport, as noted by Calciomercato, that his future could all hinge on next weekend’s result for Inter against Lazio. Luciano Spalletti’s side face a crunch showdown with their rivals to determine who will claim the last Champions League qualification spot in Serie A and join Juventus, Napoli and Roma in Europe’s top tier. Inter trail Lazio by three points, and so they need to win at the Stadio Olimpico to leapfrog them in what promises to be an enthralling final day of the campaign. It’s added by Calciomercato that should Inter miss out on the Champions League, that could lead to Icardi questioning his future and considering an exit. In turn, it adds another sub-plot to next weekend’s game, and it promises to be a tense atmosphere with repercussions likely for the side who miss out on a seat at Europe’s top table next season. Given Chelsea managed just 62 goals in 38 Premier League games this past year, the lowest tally of the top six sides, they arguably are in need of a talisman more so than United, who have Romelu Lukaku to continue to lead the line.